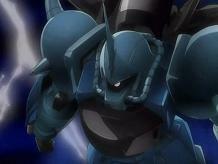 Durandal describe the capabilities of Destiny to Shinn, it was built especially for Shinn's ability. 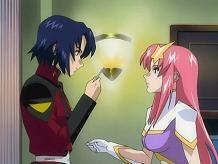 Athrun doesn't seem to like the idea. 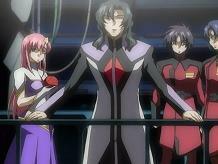 Athrun ask Durandal why was it necessary to attack Archangel. Durandal just simply say that they should've come to our side (so u can use them? pfft). Durandal babbles on about his intentions to make a world without wars and full of happiness. 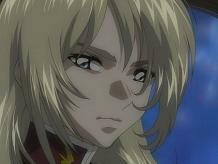 Meanwhile, EAF ships joined with ZAFT forces at Gibraltar port. Rey go to Gilbert's room and have a little chat. 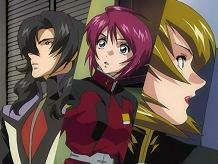 Meer overheard Durandal and Rey's conversation about Athrun.. She goes to warm Athrun about it. A security comes knocking on his door (with guns too). He escapes through the window. Athrun beats all of them up (!?) and he asks Meer to come with him. She refuses saying that if she keeps being Lacus it'll be fine.. she started crying by herself in the rain... Athrun escape into Meyrin's room. 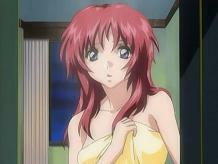 Meyrin pretends she was taking a shower, apparently Lunamaria walks by so she tells Meyrin to go get dressed. 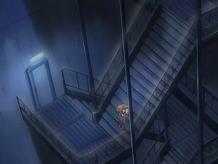 The soldiers left.. Meyrin use her computer and set the hangar's alarm elsewhere while she went to get a car. 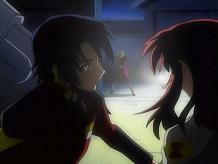 Talia asks Gilbert what's going on but Gilbert tells her that Athrun suddenly attacked a security guard and hes on the run. Rey notices that Meyrin was driving the getaway car. 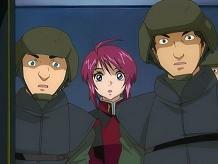 Rey found Meyrin and Athrun in a mobile suits hangar. 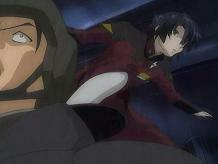 A gunfight occurs and Athrun hits Rey's gun, Athrun and Meyrin get into one of the mass produced GOUF ignited. 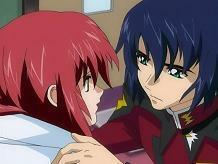 Athrun tells Meyrin that hes going to find Archangel. 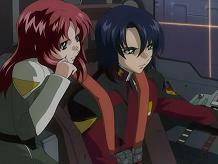 Shinn and Rey launch in Destiny and Legend, Rey tells Shinn that they are pursuing Athrun Zala. Gilbert really has a hidden agenda. 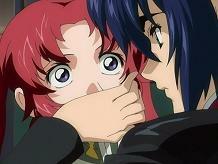 Without telling anybody wth is going on he tries to have Athrun locked up. Athrun got his moves back from seed and escape in time. This is probably the first time hes being smart after 36 episodes of flying around shooting something. Now this is the 2nd time he defected, if Gilbert's not dead there's no way he can go back. Meer also has a little bit of a change, it appears that she's not fully Gilbert's puppet yet, unlike Rey. Seeing her before the surgery was a surprise, nothing like Lacus except the.... Poor Lunamaria though, Meyrin has taken off with Athrun leaving her with idiots like Shinn and Rey..anyway what a surprise that Shinn was shocked to hear that Athrun was the one they're pursuing.. 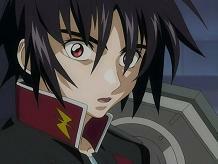 I thought he would probably be glad.. next episode Athrun fights in GOUF ignited vs. 2 Gundams, use your seed mode!